In 2017, Norco was commissioned by Atlas Elektronik UK (AEUK) to manufacture the primary composite components for 30 plus Royal Navy replacement sea class workboats over a six-year period, according to a press release by Norco. As the primary composites supplier for this project, Norco produced the major components for the new vessels including hull, deck, superstructure and associated multipurpose modules. The composite components for the workboats were manufactured at Norco’s facilities using advanced boat building techniques. Norco’s experience and knowledge in such production techniques maintains the highest standards of quality and repeatability across the range of new workboats. Norco has been working closely with AEUK and the design team throughout project, providing support in areas such as design for manufacture and production solutions. This includes the design and manufacture of high-quality CNC tooling for the production of composite parts. For another maritime client, Norco manufactured carbon suspension crew seats that are fitted to sea search and rescue boats. The seats are designed to dampen the motion of the boat over all sea conditions, which include extreme crashing waves. The improved stability from the seats ensures that the rescue crew have better visibility and can track objects out of the windows with ease whilst moving quickly over rough seas. The carbon bucket seat is a custom designed part that fits the requirements of the boat/operator, including the bespoke equipment armrests, slider tubes and footrest. It provides a lightweight solution compared to a fabricated aluminium chair or a modified off the shelf seat. 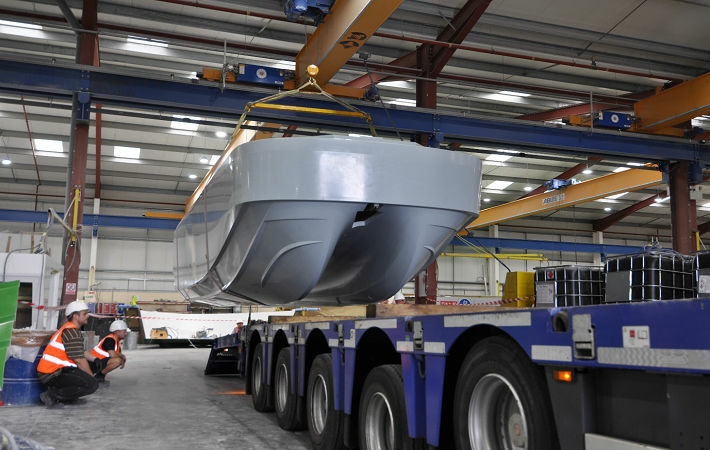 “Norco has a wealth of knowledge and experience in producing composite workboats and marine structures, with some interesting case studies to discuss from both past and present marine projects from the commercial marine, leisure and defence industry sectors,” added Bottoms.